Kayla Solomon and Jammie Lee in Edmonton. 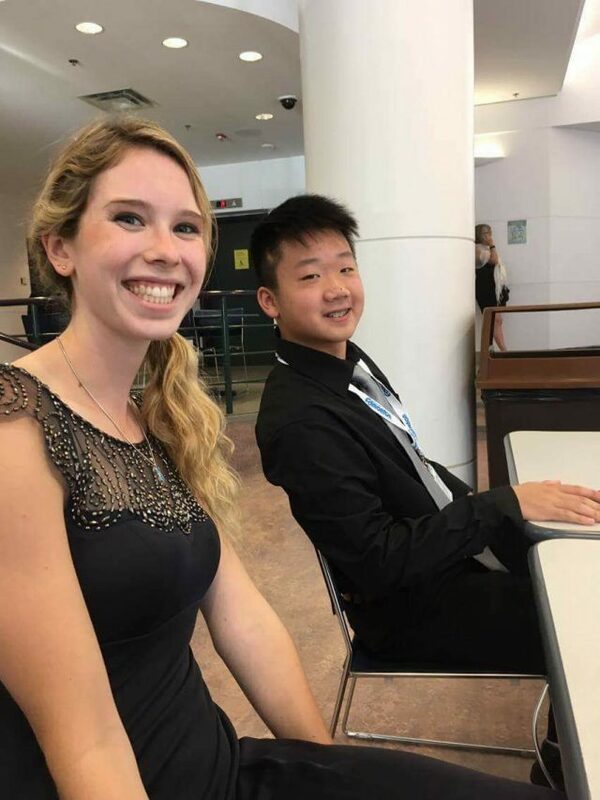 While many eyes were on the Olympic athletes at Rio through mid-August, two Brandon students were among 55 of Canada’s best young musicians performing and competing at the National Music Festival in Edmonton. Jammie Lee, on piano, and Kayla Solomon, on trumpet, are Brandon students who were among those chosen to represent Manitoba at the national competition. Solomon, who performed with her piano partner, Danielle Guina, and Lee also both played at a try-out recital at Brandon University (BU) on July 31, before heading to nationals. When they returned, Solomon and Lee were carrying the National Festival equivalent of bronze medals: each placed third in their category. Lee has been nationally recognized before. 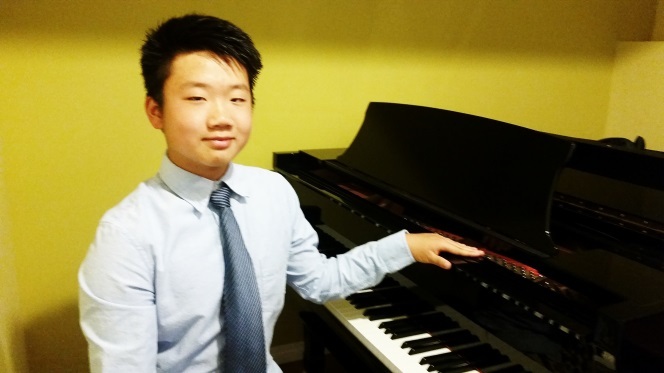 In 2011, then aged 10, Lee placed second in his age category in the Canadian Music Competitions at the finals in Montreal, playing a Mozart piano concerto. Not limited to piano, Lee also plays trombone in the Vincent Massey Band and in jazz band, and will soon begin Grade 10. He also plays drums in a church band at Grand Valley’s Korean congregation, and studies theory with Gretta Sayers. Jammie Lee poses at a piano. Lee, the son of Mija Lim and King Lee, was invited earlier this summer to play with the Winnipeg Symphony at its “Open House: Made in Manitoba” concert. Until 2015 he studied piano with Dr. Kyung Kim, and he now studies with Dr. Lawrence Jones, professor emeritus at the BU School of Music. 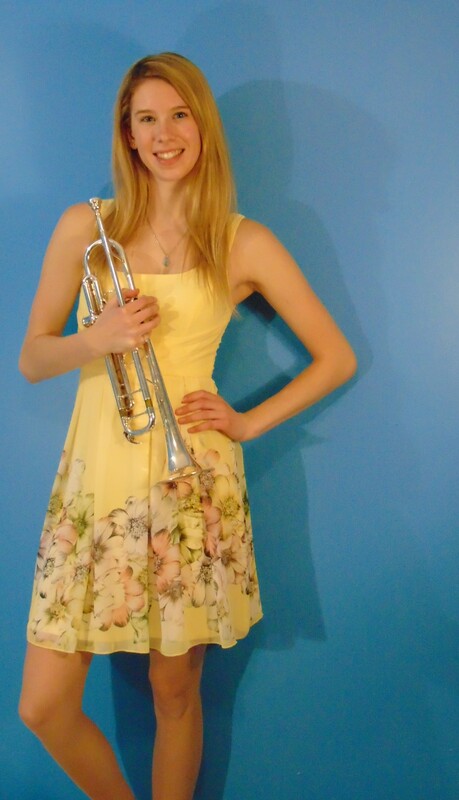 Kayla Solomon poses with a trumpet. A native of Winnipeg, Solomon has completed her second year in Brandon University’s Bachelor of Music program. The winner of many scholarships and awards, she studies trumpet with Dr. Ed Bach, himself an award-winner at the National Festival in earlier years. Before she started trumpet, she had extensive training in piano and theory with Heidi Peters, and in violin. Since 1967, the National Festival, organized by the Canadian Federation of Music Festivals, has sponsored competitions in piano, strings, woodwinds, brass, voice, music theatre, percussion, classical guitar, and chamber groups. Competitions at local, and then provincial levels, lead to national competition, where each performer selected represents a province or territory.